With this verse, Bernado Bellincioni (1452-1492), poet at the Milanese court, celebrated the beauty of Cecilia Gallerani or rather her extraordinary portrait. At the time, Cecilia was possibly the mistress of Ludovico Sforza, Duke of Milan (1452-1508). The latter probably commissioned Leonardo di ser Piero da Vinci, to create a portrait of the young girl, so that her beauty, grace and virtue would be preserved for posterity. 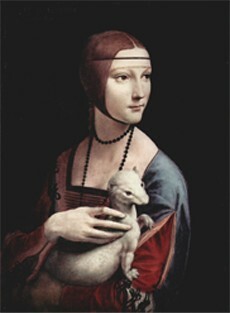 Leonardo carried out the project with the intention to demonstrate the pre-eminence of painting to poetry or sculpture. Because for Leonardo, "seeing" was the most noble of all virtues. His world revolved around the eyes. But how exactly is this form of visual perception working and what can be done with it? What does it mean to "paint after nature" and why should a painter be able to create things that no one can imagine - just like a god? Leonardo - by his own account - remained silent on these issues. He didn't want to bore anybody. On another occasion however, he answered the question that he raised himself with a kind of adequate arrogance: "Open the eyes, it is enough to see properly in order to understand." A few hundred years later Aby Warburg, facing da Vincis Madonna in the rock cave, followed this statement while putting it in his own words: "For understanding Leonardos Madonna one needs only the heart and eyes on the right place." We know now which of the two versions he meant. The same can be said about the Lady with the Ermine. In order to understand the picture, it simply requires another "view". In this case, particularly the nose is on the right place.